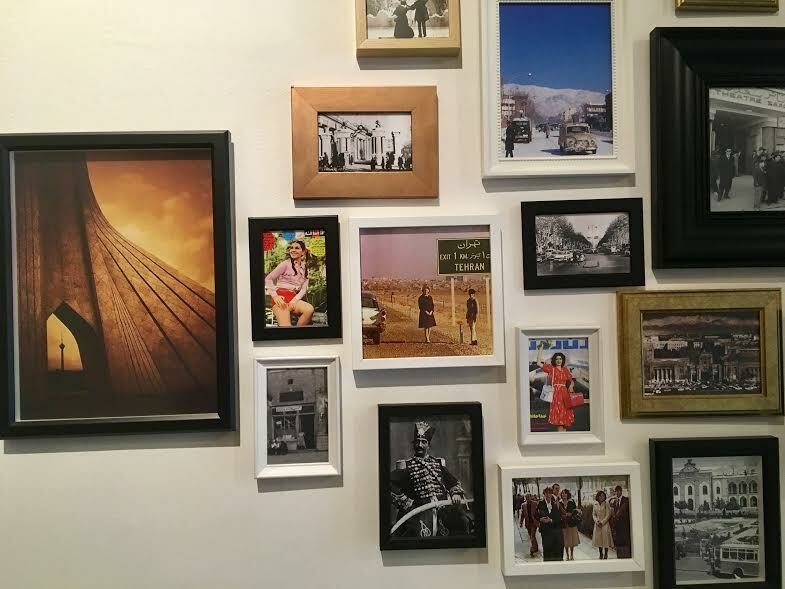 Before my recent holiday in Iran, I had lunch at a new Persian restaurant in Florence called “Tehran.” With intention, I wanted to wait until I returned from my vacation in Iran in order to see if the memory remained. If the flavors could fare well to what I would eventually devour in the capital of Tehran itself. At times, I feel perplexed with the online blogging world. We obsessively upload experiences without taking a moment to let the memory sink in, often off to the next food paparazzi event. While I may not post as much as I’d like to, what I do post is something that has left a memorable mark. And most of all, what I genuinely wish to share. In a way, I am finding reason in my infrequency- as a sort of quality filter you may say. Food to me is memory. 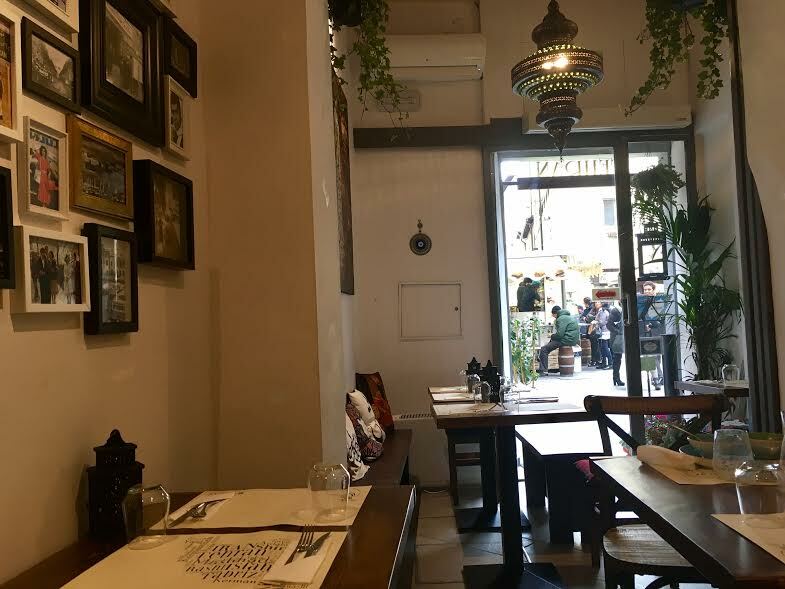 When I walked in to Ristorante Tehran on Via dei Cerchi (just a stone’s throw from Piazza della Signoria), I was immediately reminded of the smells and flavors at my aunts house. I often cite one of my aunts because she is not only one of the most adorable people on the planet, but is who kept me closest to my Iranian roots, teaching me about food, culture and sometimes a random phrase here and there which helped me tremendously in Iran. My aunt despite being in the US for nearly 40 years, remains wholly Iranian. Thanks to her, I had a sense of familiarity during my travels in Iran. I hope that even as first generation, I can pass on my beautiful heritage to future members of my family. Overall, I am impressed with Ristorante Tehran. They have a colorful gem of an eatery, rife with nostalgia for the owner’s home country from photographs to tiles and other artwork nodding to Iranian tradition. Even though I partook in the menu before being in Iran, I did feel I had a benchmark thanks to family meals and events. Of course, cuisine is always different in the homeland itself or from your family table. I did find myself comparing their tahdig (crispy oily bottom of the rice, intentionally overcooked), tachin (a block of saffron rice with barberries) ghormeh sabzi (an herb, bean and lamb soup) and torshi (pickled vegetables) to my aunt’s. 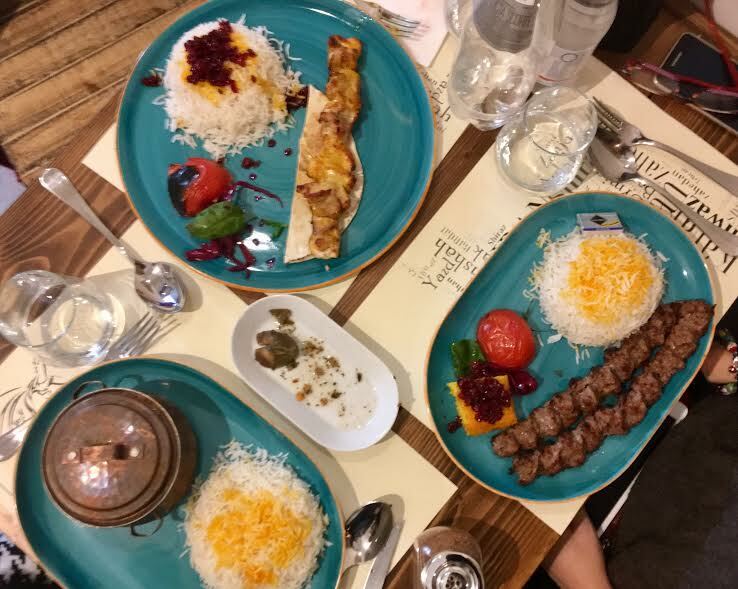 Their ground beef kebab koobideh was succulent and flavorsome. The ode to tachin and tahdig was a humble taste compared to what I found in Tehran. 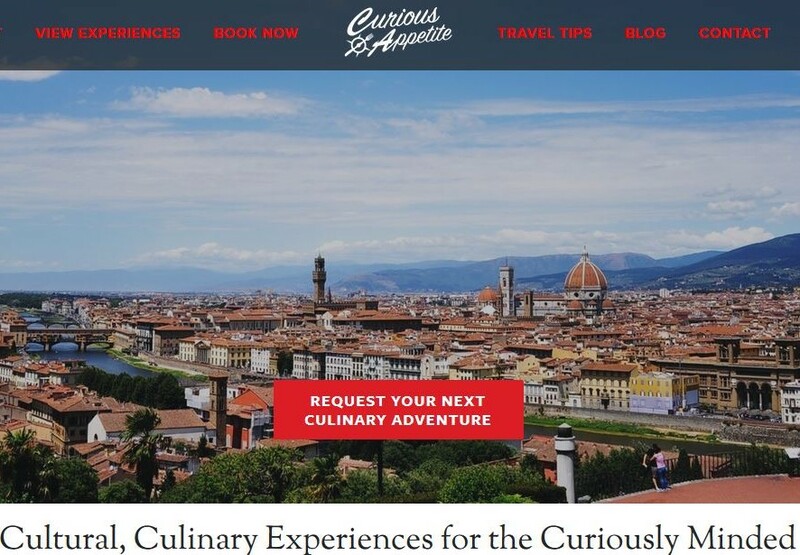 Nevertheless, I recognize that it is bold of a restaurateur to open in Florence, let alone one serving international food. I’ll be honest, some Italians can be extremely difficult to serve international cuisine to. Especially if they aren’t open minded to other cultures or considering that another culture’s cuisine might be better or just as good as theirs. Italians, rightly so, have a stubborn bias and pride for their own cuisine and you’ll find few willing to consider that Italian cuisine may not in fact be the best in the world. 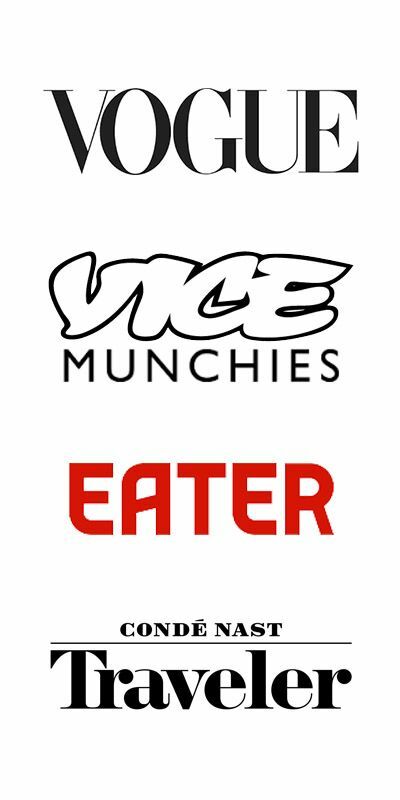 And so you have to make a convincing argument for them to spend money in a restaurant that doesn’t resemble what they grew up on or isn’t some trendy place that is doing “fine dining” or has some celebrity show pony chef in the kitchen. In America, what isn’t the stereotypical fast food garbage, our restaurant/food culture is influenced heavily by immigrant communities. While in Italy, immigration is new for Italian society. Not counting Italians that migrated from the South to the North, or strangely enough, not considering the foreign occupations over the centuries which brought exotic flavors to the Italian pantry. 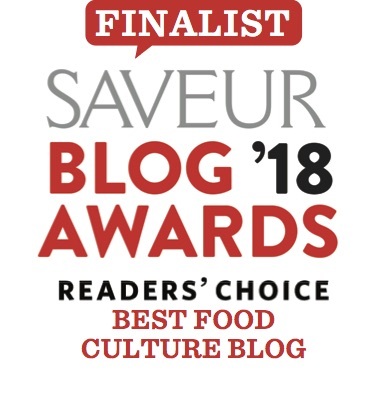 In addition of having a tough audience to convince to try your strongly spiced/herb based foods, you have the difficulty of being in the center with remarkably higher tourist traffic, and tourists generally want that “old world” rustic trattoria experience. THEN you have the added complication of obtaining all the authentic ingredients in a country that is for the most part, very Italian food-centric with very few ethnic food stores. 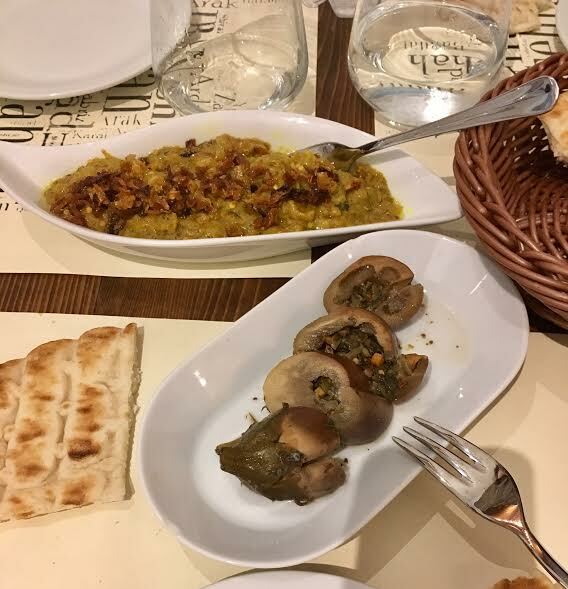 So all things considered, I think Ristorante Tehran is worth going to and applauding, I consider it a valid, authentic entry-level eatery for anyone new to Persian cuisine or for those who’d like to take a break from familiar Italian dishes. This gave me a deeper understanding as being a food writer in Italy. The basis for which Italians criticize food in traditional restaurants I suspect is influenced from how their palate was formed growing up. Us foreigners, is usually what we either experience from in-laws, culinary school, self-taught study/passion or what we have learned from eating in restaurants, etc or in my case, what I have tasted from spending time with friends and their families from around the boot in combination with culinary studies. There are of course the Italians who are the holy grail of critics because they grew up with these flavor memories AND they have completed technical, vocational culinary training. But I remain convinced that those of us who are insiders to a culture at hand, remain somewhat subjective in our judgement. These memories are connected with love, and how can you objectively convince someone that a dish is better that their nonnas or mammas? Unless they really were terrible cooks and I’m sure this memory association isn’t the case entirely, but it’s simply an observation/thought I play with from time to time. That being said, I can admit to subjective bias whenever going to an Iranian restaurant because at some point, I’ll compare it to my family’s cooking. 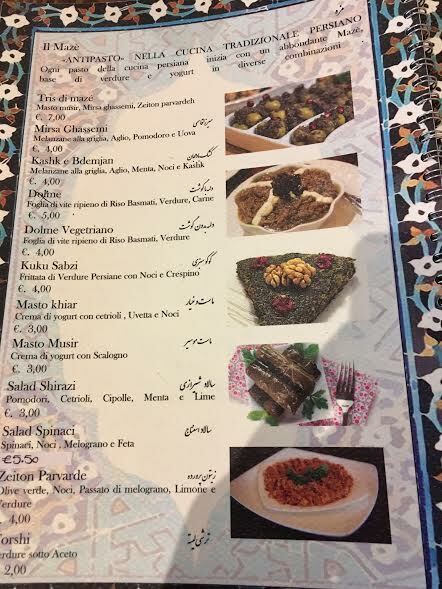 Objectively, the Persian food at Ristorante Tehran is worth a visit and accurately represents the flavor profile and technique of some of Iran’s most iconic dishes. While I will admit I did eat remarkably well in Iran, I am impressed with what the owners have managed to accomplish. Not only have they managed to procure quality Persian food, the location is central and makes a bold statement. It is apart of the ever growing proof that Florence is becoming less provincial and opening up to more international culture. If you peek outside from the eatery’s door, and look to your right, you’ll spot the exemplary Florentine landmark “Palazzo Vecchio” and in front, a tripe & lampredotto street food cart, so quintessential to Florentine cuisine. While Italians have a long way to go towards truly accepting & embracing cultural diversity (that’s the most diplomatic way I can put it), I am nonetheless proud of Florence’s curiosity for the Middle East. Speaking of which, Florence holds an annual Middle Eastern culture & film festival and it starts next Tuesday! This is possibly my favorite event in Florence- full of international film, food events, talks, photography and art exhibits, it regenerates my adoration and hope for a dynamic Florence. Check out the Facebook page here and the official website with the program here. I will be volunteering during the event and I will be posting live during the event from my Facebook page and Instagram. And if you go to Ristorante Tehran, don’t forget to order the traditional tea (which is accented with bergamot) and served with saffron sugar sticks called “Nabat” and their saffron/rose/pistacchio bastani ice cream is king. Hey! 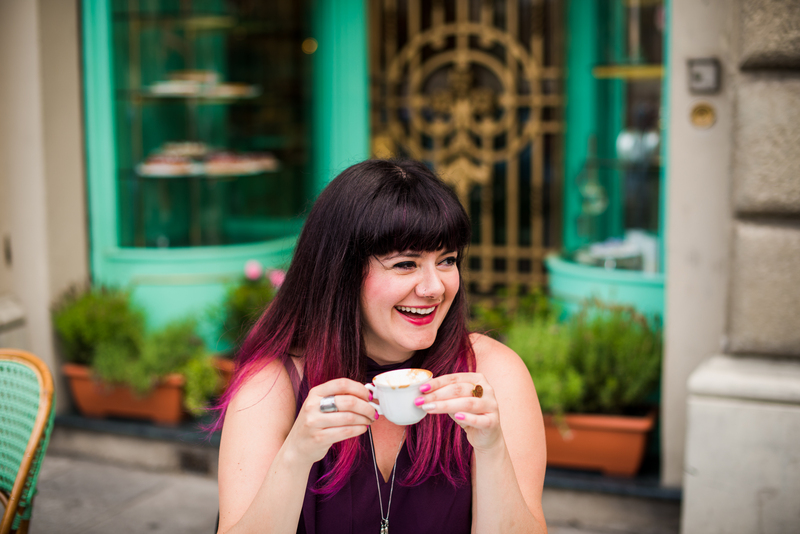 At 4pm Italy time on March 30th 2017, I will be chatting with local bloggers in Florence about FAQ regarding Travel Fears. Tune in at Girl in Florence’s Facebook page either during or after, and I’ll for sure touch upon how I overcame my own fears to travel to Iran, a destination misconstrued by the media. Happy (and safe) travels!